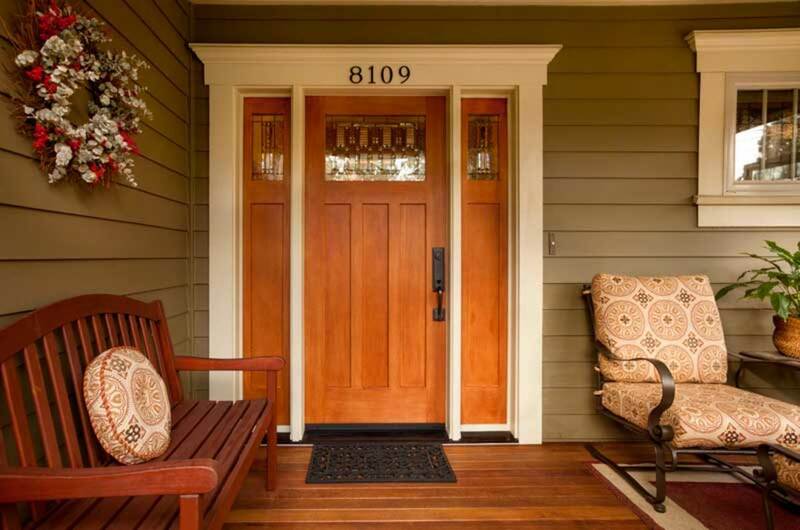 The welcoming entryway of a 2008 Craftsman. 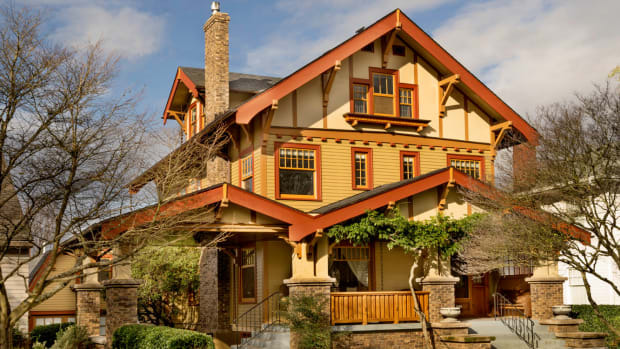 Some life changes had this couple looking to move from Albany, Oregon, to Portland, after they’d spent ten years restoring an old house that had both Victorian and Craftsman details. 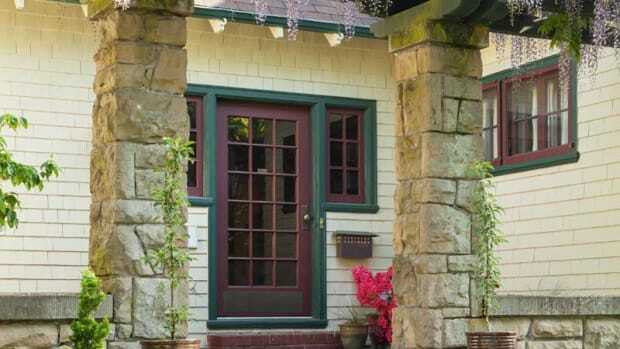 Elva Van Devender, who is a clinical pharmacist, and her chemical-engineer husband, Tye Dodge, were about to purchase a house when they ran across a new-old house in Portland’s Multnomah Village. Coincidentally, Elva was familiar with the house next door, a model called The Tabor, which she’d seen a year earlier. They found this one, dubbed The Multnomah, while checking out The Tabor on Google’s street view. 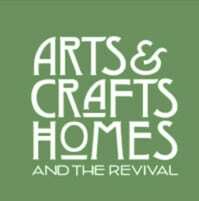 Familiar Arts & Crafts revival motifs found in The Multnomah by Skye Homes include handsome gables, shingles over clapboards, and a cozy porch with battered columns. Inside the 2008 house, the spacious open plan was a pleasant surprise; the couple’s transitional house had had small, compartmentalized rooms. (This house has two full storeys and a third-floor loft—a bonus room that can be outfitted as a home office, media room, or play area. 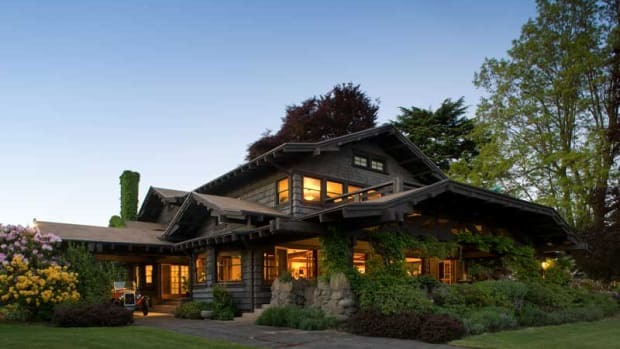 The 3,278-square-foot residence has four bedrooms and two and a half baths.) 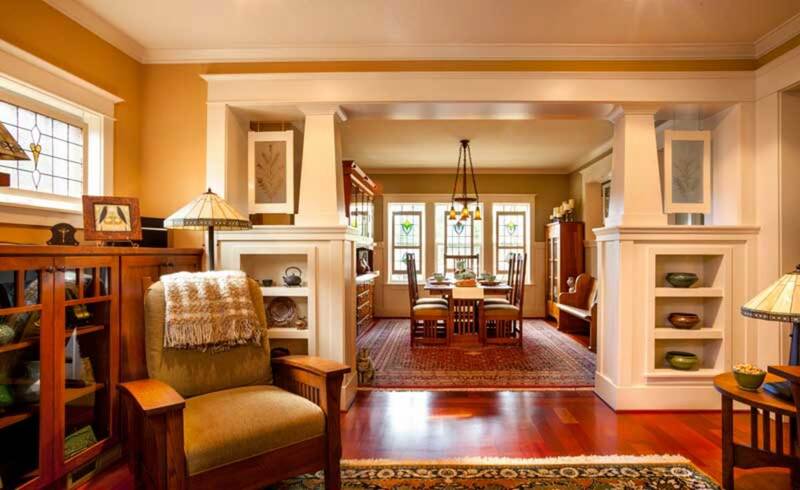 A period-style colonnade and built-ins, two working fireplaces, glass pocket doors that afford privacy in the den, and floors of Brazilian cherry with walnut inlays were undeniably handsome. The kitchen was large, as was the laundry room. 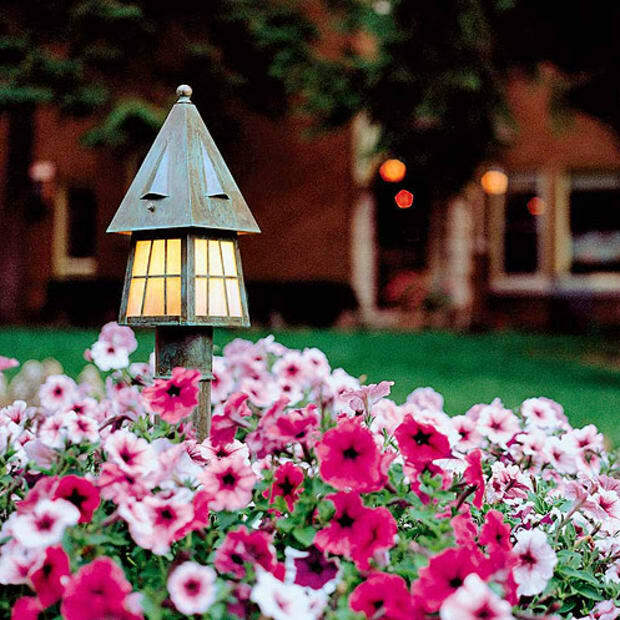 A fir tree grew protectively over the back porch, the tidy yard, and a a separate garage. The hard-to-find oak church pew came from an antiques store in Albany, Oregon. The owner reports it has a place for hymnals on the back. The previous owner had upgraded the lighting, selecting reproductions from Rejuvenation and art-glass shades. Elva and Tye say they especially like the built-ins provided by the builder. Nevertheless, they felt the dining room cried out for another, so they soon bought a rescued piece at Aurora Mills Salvage, now used as a sideboard that fills one wall. It had been torn out of a hundred-year-old bungalow in Corvallis by owners who wanted a more modern look. “We just couldn’t believe anyone would discard such beautiful craftsmanship,” Elva says. Remarkably, the furnishings from their old Albany house fit perfectly here—even the antique stained-glass windows, which the couple had purchased to create privacy from the street. Unique etched-glass windows, ca. 1890–1910, were repurposed into a wardrobe and TV cabinet by Bill Storch of Corvallis, who also reworked the salvaged built-in as a freestanding sideboard in the dining room. 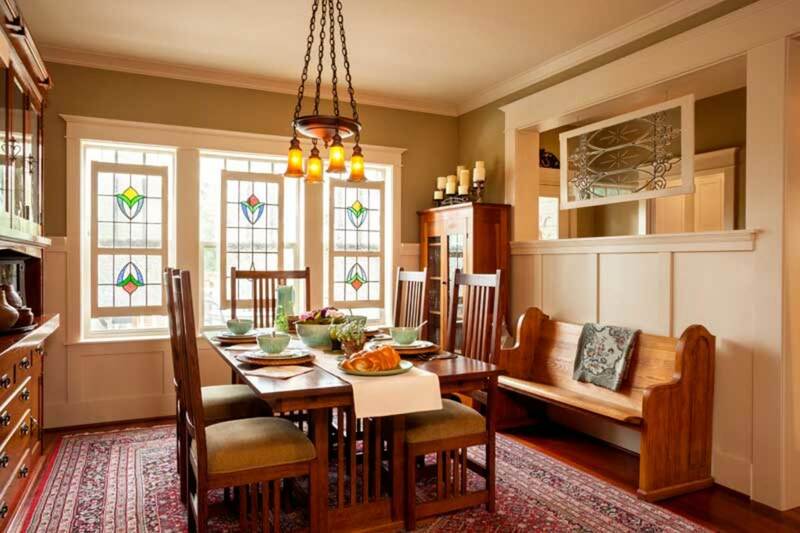 Stained-glass windows bring in light while allowing privacy. At least one thing has seen the couple through all their moves: an oriental carpet “that never met a room it didn’t like,” as Elva puts it. When her mother planned to throw away the 1960s-vintage rug, Elva took it to her grad-school flat. It has since graced floors in Charlottesville, Virginia, and Portland, Maine, before the Albany and Portland (Oregon) houses. Three Bengal cats are in residence: Nyah is the oldest, Angus the only male, and Merida the youngest. They find great pleasure in this house, prowling about the semi-open plan, sprawling in front of the fire, curling up in a Morris chair. Everyone feels at home. Elva and Tye say they envision a long succession of happy owners for this house, which itself will be an old house someday. Hung within the colonnade, the pair of antique etched-glass windows were salvaged from a torn-down pub in Scotland. Panels hung in the dining-room windows are also antique. 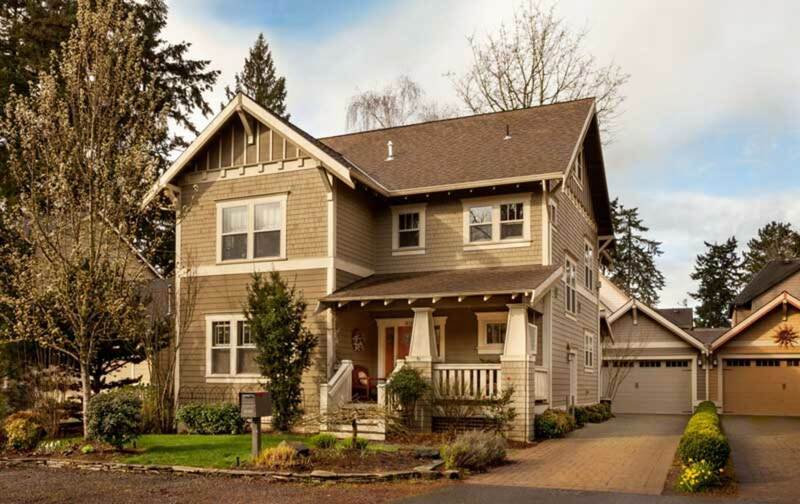 Skye Homes owner Bruce McIntosh dubbed this design The Multnomah, and it was a keeper, from its battered porch columns and bungalow-era gable to its colonnades and pocket doors. 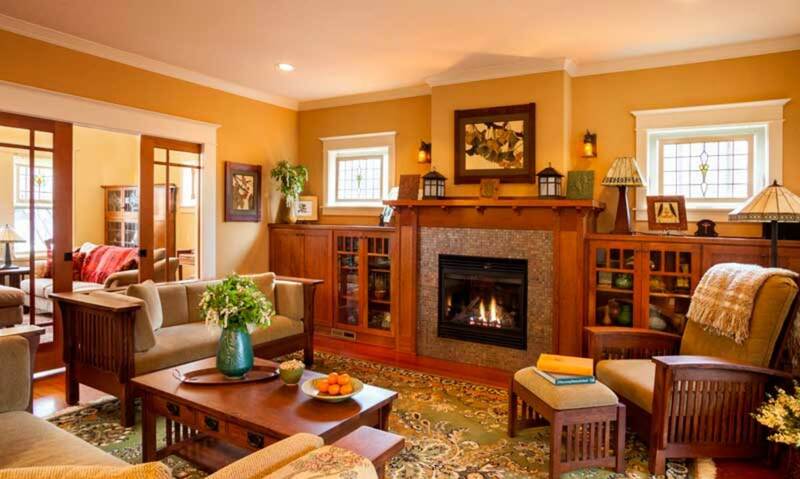 The couple had thoroughly enjoyed restoring and living in their old house, which was built in 1908. But they came around to appreciate the advantages of a new old house. This one is up to current standards of energy efficiency, and the working fire- places are safe. What’s more, their old house had no built-ins, and this one does. 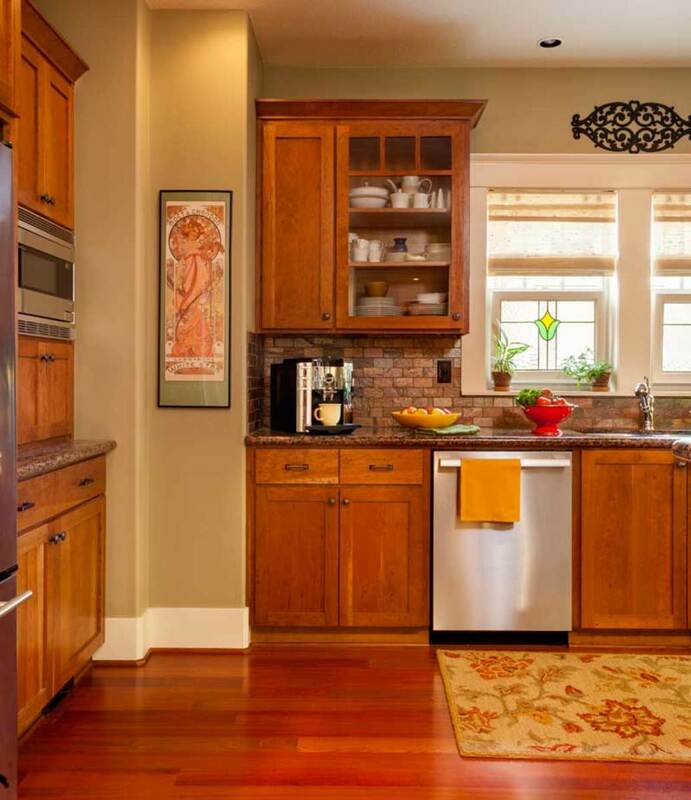 Strong, natural materials define the kitchen: cherry cabinets, granite countertops, travertine tile, and stainless steel. Skye Homes’ kitchens and bathrooms feature efficient space planning, along with built-ins that are as functional as they are period inspired. 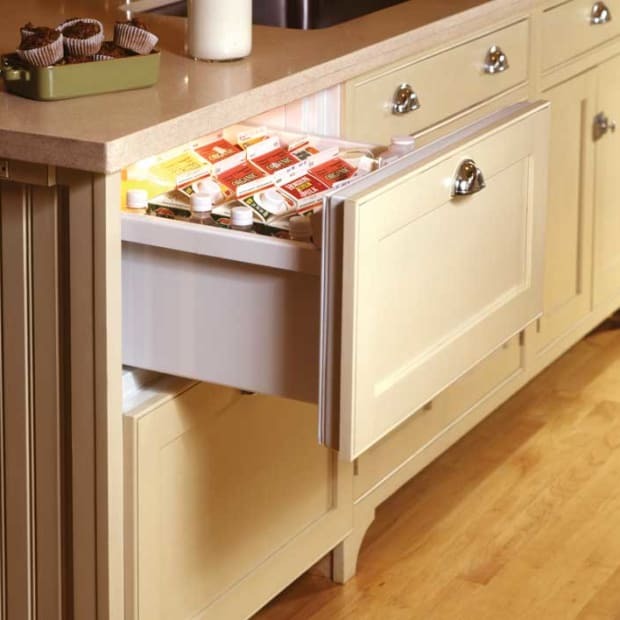 In this house, the kitchen incorporates furniture-like cabinets and a wall pantry. 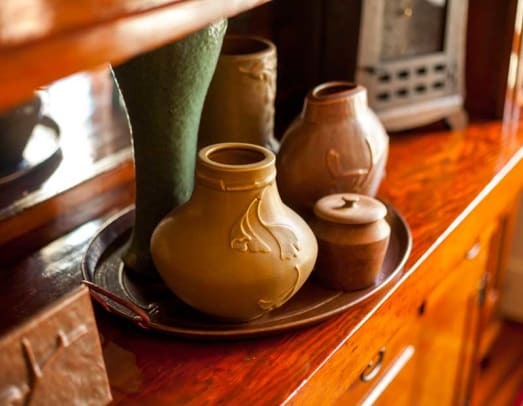 The nicely detailed upper cabinets include some with glass fronts to display dishware and pottery. Iridescent travertine tile in the familiar 3" x 6" brick or subway-tile shape makes up the backsplash. Iridescent travertine mosaic tiles back the Viking range. Countertops are granite. 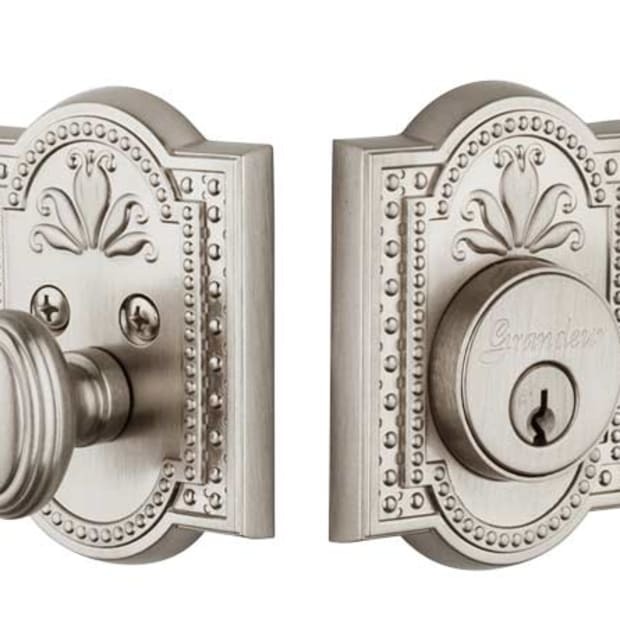 Hardware and lighting fixtures are period reproductions. Salvaged stained glass came along from the couple’s previous home.